Ahh, summer vacation! Jeremy Wilderson, Scottsville Middle School’s first (and only) retrieval specialist, is enjoying a slower-than-usual season of retrieving (NOT stealing) lost objects in order to help the under thirteen population of Scottsville. But crime doesn’t take a vacation! 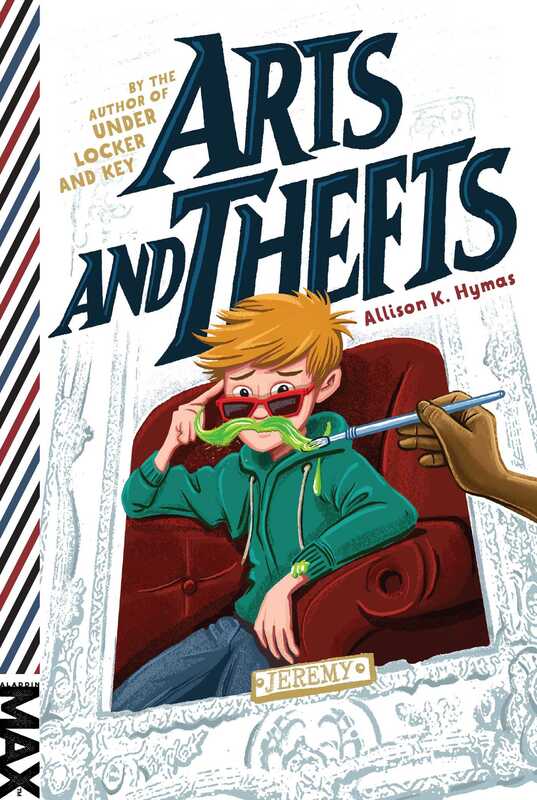 And when sabotage strikes Scottsville’s event of the year—the Summer Art Show—threatening to ruin the burgeoning painting career of Jeremy’s best friend, Case, it’s up to Jeremy to figure out what’s going on. Of course, his archrival Becca Mills, who just happens to think Jeremy, Case, and their friend Hack are involved in the crime, is also looking into it. Jeremy has only a few precious hours to stop the sabotage before more contest entries—and kids’ dreams—are slashed and burned. But Jeremy’s specialty is retrieval…not detective work! The only solution is to team up with Becca to solve the case, something Jeremy’s not exactly thrilled to do. Not to mention, he has to keep his alliance with Becca a secret from Case and Hack, who will disown him if they see him working with the enemy. Somewhere between being stuck inside an air vent and slathered in red paint, Jeremy has to wonder: is he in over his head? I HAD NO IDEA TROUBLE was brewing until Case busted through my back door at sunset one Thursday during summer vacation. Hey, don’t think that because I didn’t have my thumb pressed to the pulse of Scottsville’s criminal activity, I’d been slacking at my job. I’m not a crime lord, and I’m not a detective. My job starts after the crime has been committed, when the victim comes to me with a sob story and a slice of chocolate cake. That’s when I sneak in and retrieve the stolen object from under the thief’s nose. But I had tried to pay a little more attention that summer. If I’d been more attentive during the school year, I’d have known that Mark Chandler was a dirty criminal psychopath posing as an innocent victim—definitely not someone who needed my help. My contacts who usually told me when a potential client was looking for my skills, or any information I needed to retrieve something successfully, were gone. Cricket had packed up his impressive collection of denim clothing and left with his family for a few months in Canada, and Tomboy Tate had given me one last list of kids who were feuding (and thus may steal from one another) before going to summer camp. The silence on the underground wasn’t too odd, or even worrying. Summers are generally pretty chill work-wise for me, so on the sunny July day when our story begins, I had biked, swum, and played video games with Case and Hack. Then Case went off to meet Elena Trujillo at Comet Cream, which is an ice cream parlor that he frequents because it’s a good place to find clients from all over town. I avoid it because Becca Mills—the tiny yet terrifying private detective whose goal was to see me in detention for life—knows this fact. Fast-forward to an hour later, when Case burst into my house without knocking, eyes wild. “We have a problem,” he said, shutting the door behind him. “How about shut up and go away?” I said as Case pulled a pencil out of the back of one his Philadelphia Eagles gloves (which he always wore to protect his artist hands) and anxiously tucked it over his ear. I went to the window and looked. Becca Mills was in my backyard, arms folded, grinning at Case and me through the window. I turned back to Rick, who was taking a long gulp from his can of soda. He didn’t seem to have heard. But I had to get rid of him before words like “criminal” and “forger” infiltrated his thick skull. “Don’t you have homework or some college pamphlets to read?” I asked my brother. Oh, right. Football camp. Like he hadn’t mentioned that six times a day all summer. “Stay behind me,” I told Case. “We aren’t thieves!” Case said over my shoulder. Becca’s evil smile grew. “Felony in all fifty states,” she said, and Case tried to push past me. “No one likes you, snitch!” he called to Becca. “Proves what? I have no idea what you’re talking about, but I can’t wait until you tell everyone that going to a friend’s house is a crime. Now, good-bye.” I stepped back inside and closed the door. “You can’t hide forever!” Becca called, but I ignored her again. “Good.” I turned around to see Rick leaning against the stair’s banister. Oh, great. Case glanced from Rick to me, breathing hard. He thought Rick was serious. But I’m familiar with my bone-head brother’s ways. He knew nothing, and therefore his threat was as empty as the top half of a bag of chips. I pointed a thumb at the stairs. “Come on, Case. Let’s talk in my room. Rick’s not allowed to bother me there.” I glared at my brother. “That was one time!” I called as I hurried Case away. In case you were wondering, it was smoke. Case, Hack, and I were experimenting with invisible inks. Most of them are made visible with heat. We had a little accident. “Hold on.” I ran downstairs, grabbed a can of root beer, and hurried back to my room. “Here,” I said, offering it to Case. “Drink up, and tell me what happened.” Case was high-strung, but he had never run into my house without the requisite social niceties before. Like knocking, or taking the time to catch his breath. As Case chugged the soda, I thought about Becca’s appearance at my house. Now she knew where I conducted my business. That wasn’t good. I also didn’t like her threatening Case. Sure, Case was a forger. He was a talented artist who used his skills with pen and brush to create fake hall passes, late notes, and the occasional school project, but always for a good cause. Like me, he used his talents to help people. I’d never steal something outright, and he’d never fake an assignment to help a cheater or to give someone false credit. The way we worked was hardly a felony. Well, I guess there was my last big job. I’d been tricked into stealing, outright stealing, the master key that unlocked every locker in the school for a guy named Mark, who used it to steal from everyone in the school—Case, Hack, and me included. I had to team up with Becca Mills to stop Mark and return the key to the teachers. But Case couldn’t possibly know about the fact that I had worked with Becca. He and Hack hated Becca, and if they knew I’d worked with her Case wouldn’t be over here downing a soda in my room. He’d be screaming at me, vocalizing his betrayal in the loudest way possible. That, or avoiding me completely. Which was why I’d never told him or Hack about Becca’s involvement in that job. It couldn’t be about a more recent job either. Since school had ended, I’d only retrieved a few retainers left at the public pool after closing time. Like I said, work was slow over the summer. Case slammed the empty can on my side table and belched. “Excuse me. Okay.” He sounded calmer, but I detected a small twitch in his fingers. Maybe it was just the soda. “I always thought they just took pity on her,” Case said. His fists clenched. “You okay?” I asked, pointing at them. I thought of Becca standing near the edge of my backyard, reminding Case of their conversation. She definitely had a mean streak. “Becca had a list that Heather gave her of the brushes she had stolen. They’re good brushes, and she had a variety. A bright, a fan, an oval wash, a highliner, a round, and a one stroke,” Case said, counting them off on his fingers. “I think you’re right. I wanted to be helpful so she wouldn’t bring up felonies again, so I gave her detailed descriptions of each kind of brush stolen. Heck, I drew pictures! But now she knows what to look for. She’ll recognize them when she sees them.” Case’s eyes scanned my room, like he thought the brushes would be lying on my dresser. “I swear, if I ever have a job like that again, I will tell you everything.” I’d promised my friends that I would inform them of any future jobs I took. Keeping the truth from Case and Hack while stopping Mark had been too hard, and, since it seemed unlikely I’d ever work with Becca again, it shouldn’t matter. It seemed Becca had similar thoughts. Never mind her animosity during our backyard visit—the hatred had been obvious for weeks. On the last day of school and every time I ran into her around the neighborhood, she shot poisonous glances my way. Yesterday I’d seen her glare at my house. I was at my window, reading. She couldn’t see me, but it was like, to her, my house was evil because I lived there. I had no idea why she was mad at me. I mean, we caught Mark, didn’t we? I may have broken a few rules in the process, but hey, she seemed fine with that in the end. Right up until she wasn’t. So what had happened? Why didn’t she come to me instead of Becca? Heather knew me; I’d done a couple of jobs for her in the past. Also, I charged way less than Becca for services rendered. Detective Becca Mills charged cash money for summer work. Why wouldn’t Heather hire me for a quick retrieval when all I asked for in return was that my name get passed on and maybe a slice of chocolate cake? Was there some kind of extenuating circumstance that made me unfit for Heather’s job, like a conflict of interest or something? I bet she loved that, I thought, smirking. Case tended to wax eloquent when it came to art. Also forgery, though he wouldn’t dare discuss that side of his craft with Scottsville Middle’s number one under-thirteen private investigator. I did. The Scottsville Youth Art Show and Competition was the biggest competitive event Scottsville held over the summer. Sure, you had your occasional street carnival and the Fourth of July was always exciting, with barbecues and parades and the fireworks, and of course, Rick and I dominating the Wilderson Family Picnic water balloon toss. But the art show meant not only outdoor festivi ties in the park, but prizes and glory for the competitors and bragging rights for their parents. Depending on how many sponsors they had, scholarship money could be even awarded to the winning artists. Those years always went down in history, and not always for the right reasons. As far as I knew, the prizes this year were minimal. A picture of the winners in the local paper, the Scottsville Gazette, and some top-notch art supplies for each of the winners in three divisions: painting, photography, and sculpture. There was a Best Overall Art prize that was awarded to someone whose art was deemed the best in the whole contest out of all three divisions, and they also got art supplies, a picture in the paper, and the honor of having their art on display in Scottsville’s art museum until next year’s competition. That last item might explain Case’s anxiety. My friend was such an artiste that he needed his work to be perfection before anyone saw it, which made him a good forger but a difficult person sometimes. The idea of his painting hanging in a museum for all to see probably gave him insomnia. I guessed the other artists were the same way, but Case took it to a level that proved that freaking out can be its own art. “Some guy’s painting got made fun of. He lost. Right?” I honestly didn’t know too much about that one; after the contest no one talked about it again. “Right! What if that happens to me? Or what if I spill lemonade on my pants, like that sculptor girl two years ago? She got her picture taken for the paper with a wet stain across her lap. That’s it—I have to go home and practice walking with a full glass.” Case stood and ran out of my room, downstairs, and out the back door. I heard the door slam. “Thanks for the intel,” I said to my empty room. Then I lay back on the bed. Case running off without a good-bye illustrated how freaked out he was about this contest. Sure, things happened at the art show, but not every year. Sometimes it was just an art show. An art show with nervous contestants and some quality prizes, but an art show. Maybe Case would calm down a little. Right, and maybe he’d invite Becca over to play some Madden with Hack and me. After seeing Case lose it over Becca’s interrogation and his almost-fight in the backyard, I was glad I’d never told him or Hack about my time working with Scottsville Middle’s most feared detective. I’d never be able to explain it in a way that would prevent Case from feeling betrayed. But that was an old problem, neatly avoided. I had bigger things to worry about. I hadn’t lied when I said Becca was good enough to catch the real thief, but I also knew that she hated me enough to only see the clues that led to me, or worse, to Case and then to me. At least she would at first. She might move on, but only after harassing both of us for days. In fact, I couldn’t believe she wasn’t already knocking on my door, hand-drawn warrant in hand, ready to accuse me. That could get awkward if Mom and Dad and Rick saw. They wouldn’t understand. They’d think she was my girlfriend or something. Ugh. Can you imagine, Becca and me? We’d get along like two betta fish in the same tank. At least, we would now. There was a moment at the end of the Mark job that I thought Becca and I could be . . . well, no longer enemies, but that passed quickly. The best plan was to relax. When the detective came, I’d tell her the truth and send her on her way. Case and I were innocent, so we wouldn’t be in any trouble. But trouble has a way of kicking in my door, no matter how many bolts I use.